A Year of Being Here: Dana Wildsmith: "Evening Song with Max"
helping a peaceable night come on. "Evening Song with Max" by Dana Wildsmith. Text as published in Our Bodies Remember (Sow's Ear Press, 1999), used here with permission of the poet. In addition to her website, visit her blog. 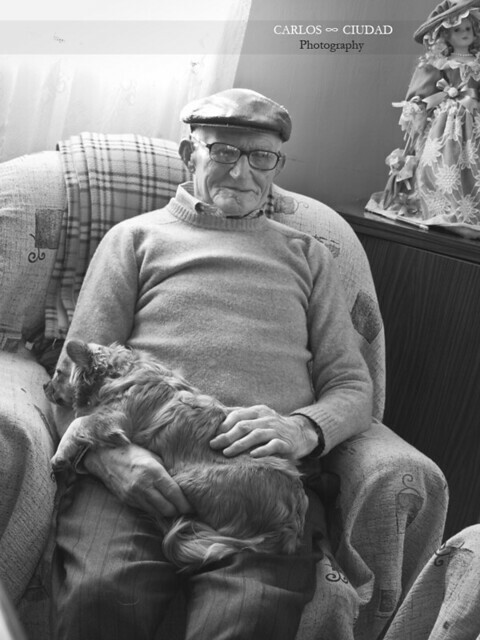 Art credit: "Black and white portrait of old man sitting on armchair with small dog sleeping on lap," photograph by Carlos Ciudad Trilla, uploaded January 31, 2010.